A native of Glenarm, the first of the beautiful Nine Glens of Antrim, Felix McKillop retired from teaching in 2004 after 31 years working in the same school. He is particularly interested in genealogy and local history and has penned a number of local history publications of the East Antrim area. Married with three daughters, Michelle, Catherine and Sarah, Felix lives with his wife Janie and children about 8 miles inland from the village of Glenarm. Some of the beautiful photos of the local area have been used with permission of the owners of Dobbins Cottage, a perfectly restored cottage set in the idyllic countryside of glenarm. If you are interested in somewhere ideal to stay within the local area please click the link. 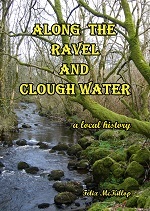 ‘Along the Ravel and Clough Water', published in November 2012 examines the history of Glenravel, Clough, Newtowncrommelin, and Rathkenny - all located a few miles NNE of the town of Ballymena in County Antrim. The book title is a reference to the local river which passes through the district. Within the areas mentioned is a wealth of interesting archaeological and historical materials and also two diverse cultures which have managed to live in relative harmony for quite a long time. The two hundred plus pages of this hardback volume offer fascinating accounts of people, places and events from the first habitation of the area some 6,000 years ago. The book concentrates very much on people - the heroes, the characters, the miscreants but more especially the ordinary people who are the real story of these 6,000 years. Although set in a strong historical framework the main aim is to place before the ordinary reader an easily read book telling in simple terms the life stories of the people who have shaped the area. Many of these stories are simple but interesting, some are truly dramatic. Someone’s hero maybe someone else’s villain but the author sets out the evidence as he finds it having researched a wide range of documents, artefacts and the oral traditions of the area. The reader is helped along by a series of maps, diagrams, drawings and a vast range of photographs especially of people. A comprehensive timeline is of great value in helping the reader keep events and time in a simple sequence. A great benefit for any reader is a detailed index giving access within seconds to any person or event. 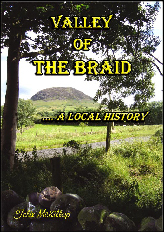 ‘The Valley of the Braid, a local history', published in November 2010 looks at the agricultural heartland of Ballymena, a mainly rural area including the village of Broughshane. Similiar in format to some of the previous publications it looks at life in the valley from the earliest settlers, through the Christian era, the settlement of lowland Scots, the various rebellions and global wars to the present day. Sprinkled with hundreds of photographs, maps and sketches the book looks at the growth of Broughshane and its elevation to international prominence through its vast number of floral and environmental awards. The lives of well known sons of the Braid, like General Sir George White, the hero of the Boer War, Sir Samuel McCaughey, the sheep king of Australia and acclaimed actor, James Nesbitt, are well documented. This publication is packed with so much material and information that it is impossible to do it justice in such a short blurb. 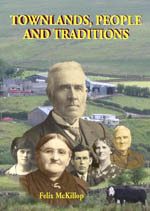 ‘Townlands, People and Traditions', examines the history of many townlands in East Antrim, especially in the Glenarm and Cairncastle areas, as well as the people who lived in them. The book details the history of over 100 families. Also included are the traditions and customs of a rural people who chiefly depended on agriculture as a way of life. This book should be of particular interest to those who are trying to trace their roots in the East Antrim area. Includes a detailed index of common names and place names. 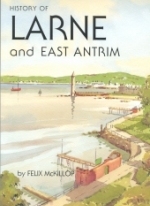 'History of Larne and East Antrim', was published in 2000 the main emphasis is on the history of Larne, the second most important sea port in N Ireland, but smaller settlements in the Larne Borough area, such as Gleno, Carnlough, Glenarm, Ballycarry, Glynn and Cairncastle, have not been neglected. Adorning the cover of this book is one of local artist Sam McLarnon's exquisite water colours. Includes a detailed index. 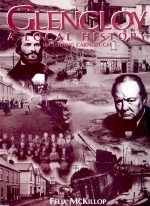 'Glencloy, a local history (including Carnlough)', published in 1996, examines the history of Glencloy, the second of the Nine Glens of Antrim from its earliest settlement to the year of publication. The village of Carnlough which lies at the foot of the Glen on the sea coast is dealt with in detail. Includes much information of genealogical interest. 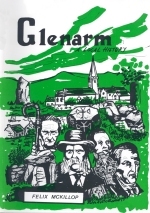 'Glenarm, a local history', published in 1987, looks at the history of the Glenarm, Cairncastle, Ballygally areas of East Antrim. It traces life in the area from the earliest settlers up to the date of publication. A very popular book it has received much praise over the years.